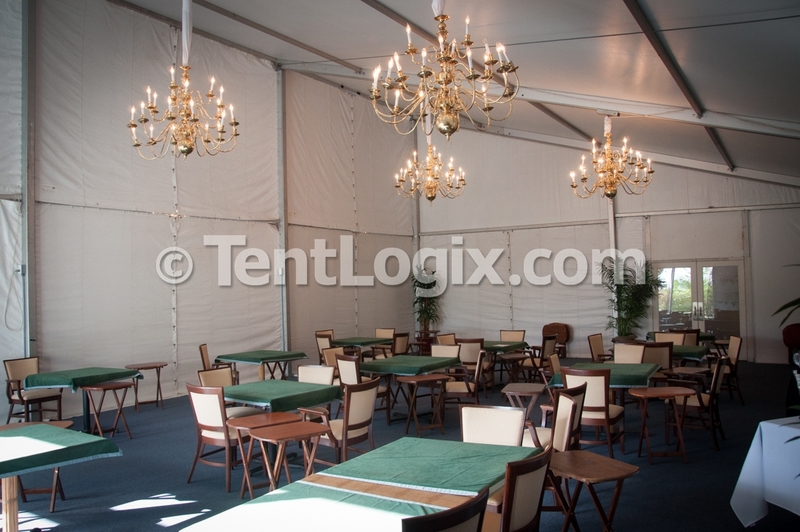 Long-term rental of clear span tent structures make an ideal solution for clubs, resorts, and hotels during large-scale renovations. 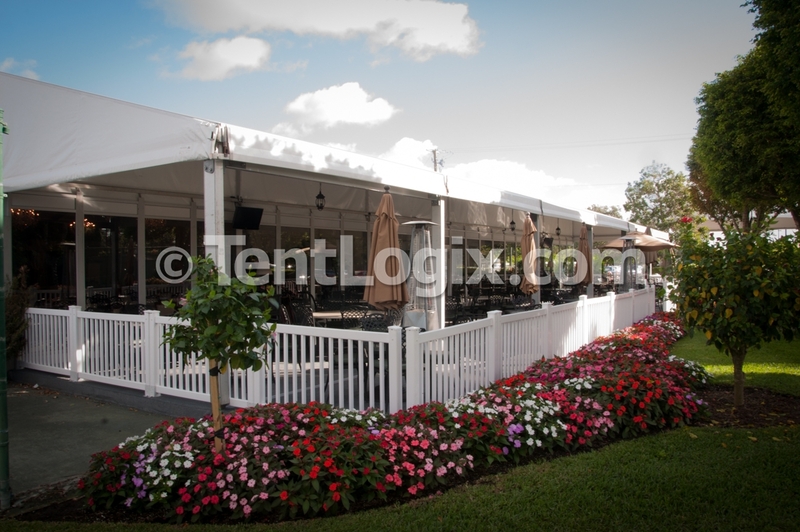 TentLogix recently partnered with another South Florida country club to create a beautiful and functional temporary club house. 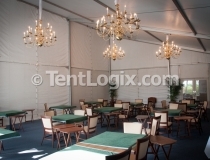 Long-term rental of clear span tent structures and auxiliary tents make an ideal solution for clubs, resorts, and hotels to comfortably transition members and guests during large-scale renovations. 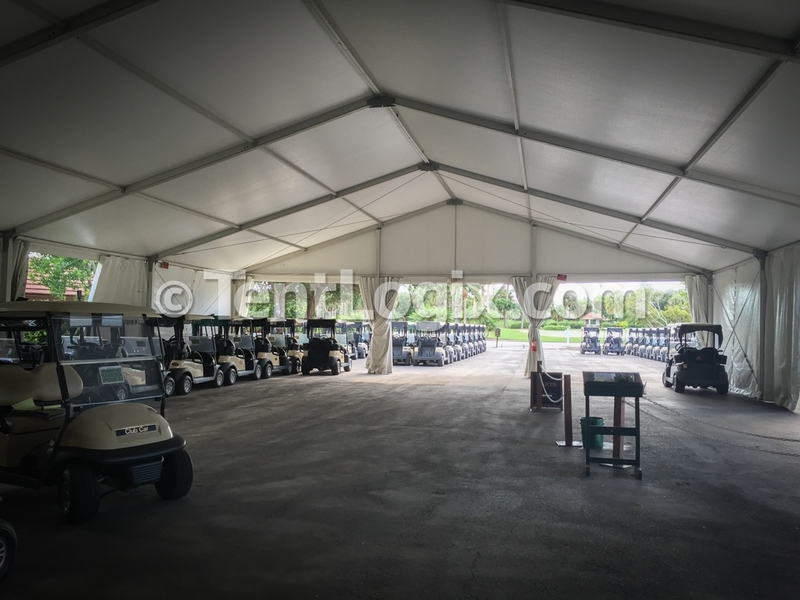 This specific project began with a 15m(49’) x 30m(99′) structure to house golf carts as the construction began. 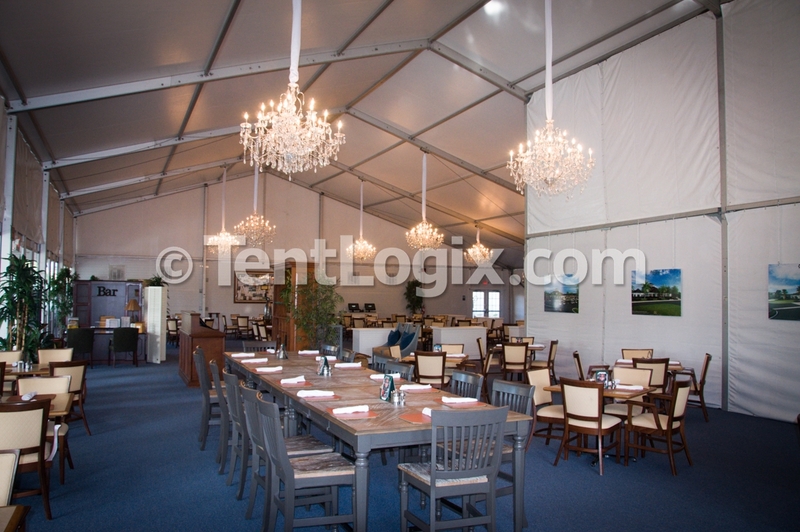 From there, TentLogix installed a 25m(82’) x 30m(99’) Losberger clear span structure on 13’ legs. 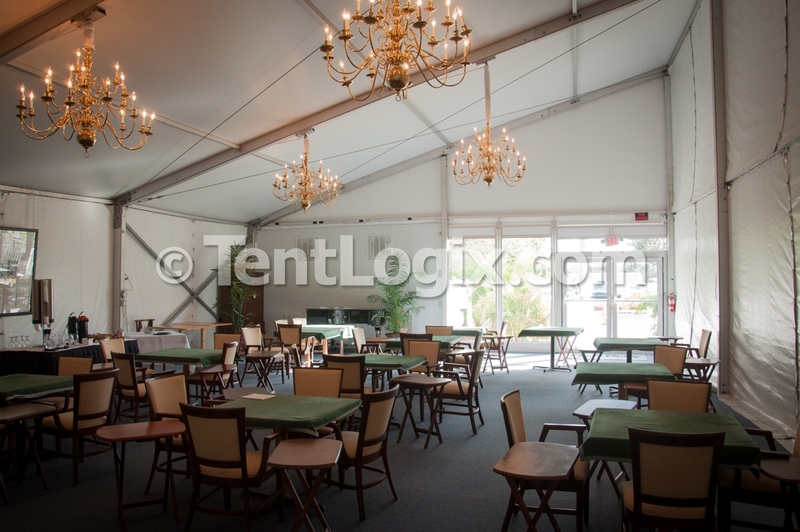 To accommodate club member’s desire for an outdoor dining space, the tent is oriented in such a way to allow for an exterior deck, and tucked beneath a small grove of trees amongst a beautiful natural landscape – making the al fresco dining experience very organic and natural. 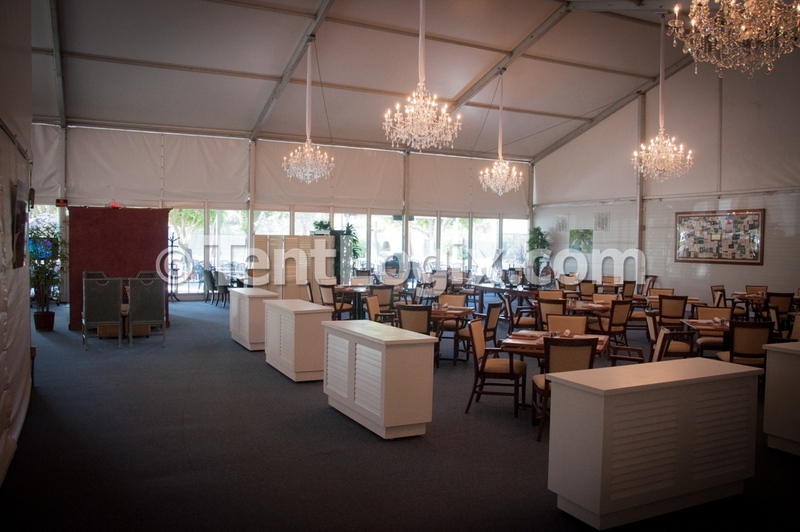 The clear span entrance was created using glass walls to allow for natural light with dimmable crystal platinum chandeliers hanging throughout the dining facility. 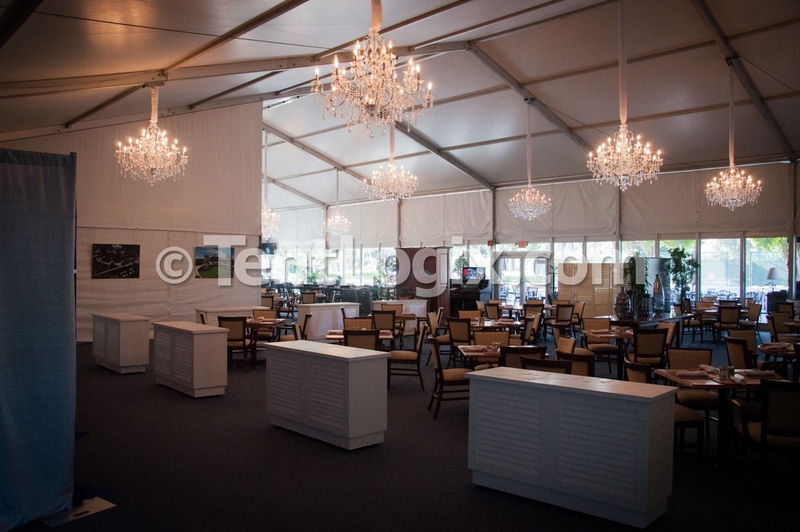 Members and guests are greeted by a concierge – an experience consistent with the regular club, and a comfortable a bar/lounge area sits off to one side creating a warm, inviting space for members to relax. 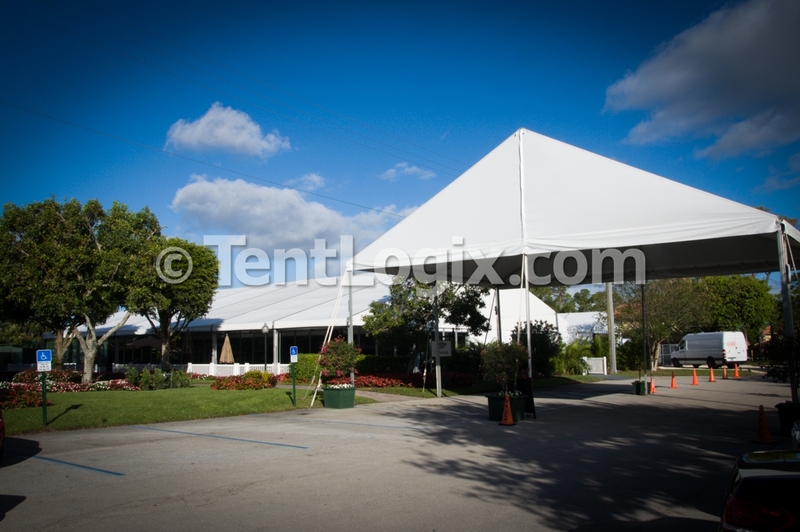 The structure is sectioned off using sidewalls which can be opened and closed to accommodate larger events inside the space and a restroom trailer, connected with 30’x55’ covered tent, is provided immediately adjacent to the main clear span structure. 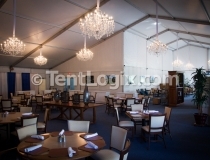 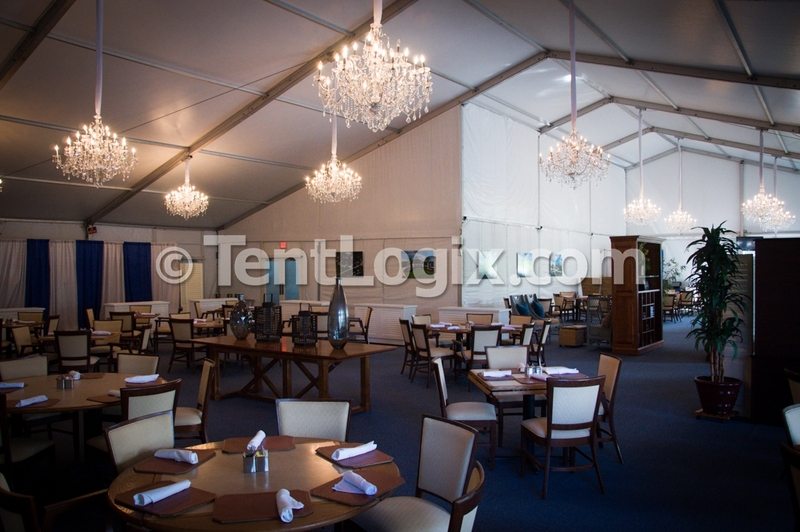 TentLogix recreated the existing club house kitchen, resized to fit in a 1,800 square foot tent. 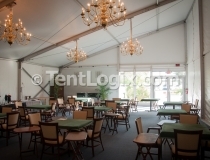 We provided anti-bacterial flooring, and hood suppression units with self contained ansul systems to house the club’s cooking equipment. 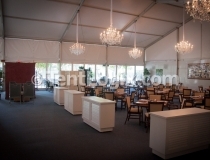 All of this was accomplished by working closely with plumbers & electricians to customize the plans and create an efficient workspace that maximizes the flow of catering activities. 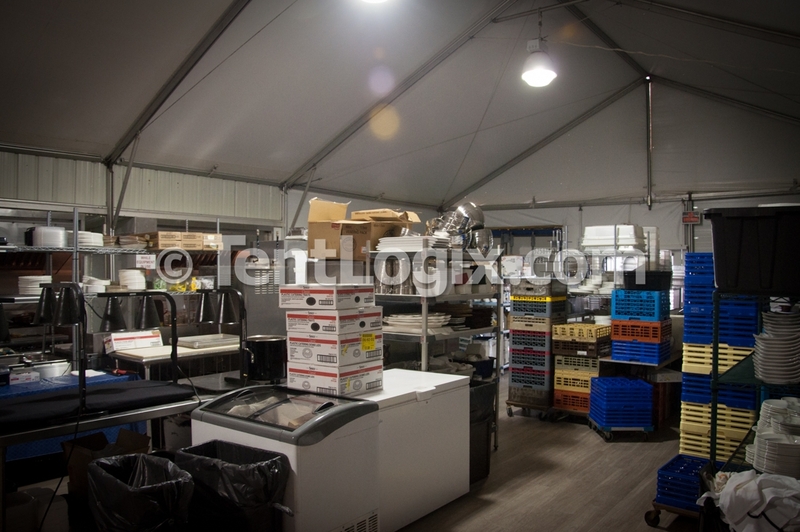 This temporary kitchen also contains the same amenities you would find in a permanent kitchen; a dish washing station, ice machine & soda dispenser, Server Point of Sale system area, and prep areas – complete with sinks, storage and coolers. 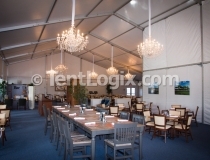 The entire facility is climate controlled, and connected to shore power/permanent plumbing. 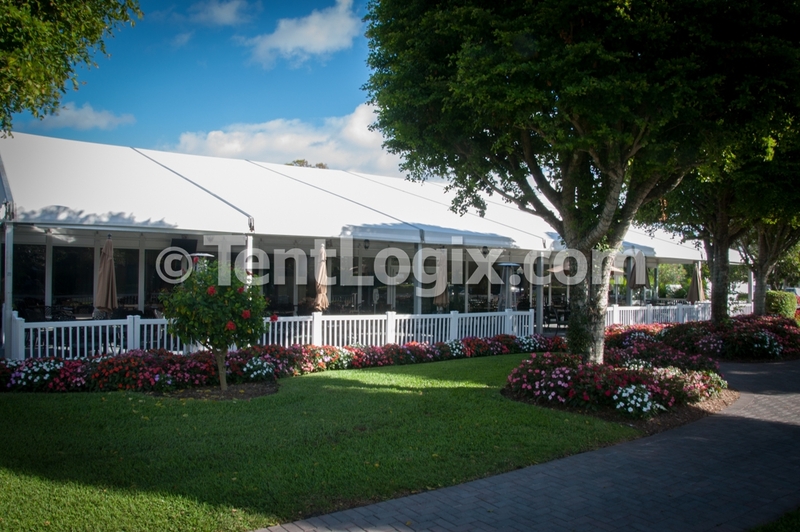 TentLogix worked within city guidelines – partnering with an architect and providing the required engineered drawings to insure the final product met all municipality requirements.